Homemade Pizza Company is pizza you cook at home. Not frozen, not ordered in, not so cheap, but much better than any pizza I’ve cooked in my oven. 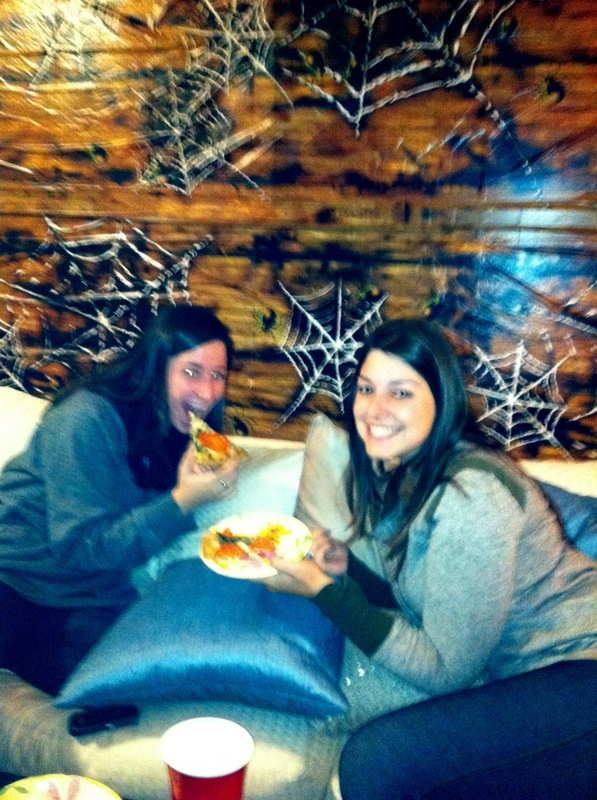 This past weekend I celebrated Halloween with my two favorite things-> my friends & pizza. Nine girls came to my apartment to sample a variety of pizzas from the new Gold Coast location of Homemade Pizza Company. I wanted to try a variety of pizzas and the store employees were patient and helpful 🙂 I ordered two medium pizzas and two large pizzas with a variety of toppings. At HPC, you can create your own pizzas or order their “Homemade Favorites” (which claim to be cheaper based on the number of ingredients included). The pizzas I ordered are as follows… and they were beautiful. The only pizzas I chose from the menu were the four cheese & milesian. I was surprisingly impressed with my creations because the ‘critics’ raved about those even more. Suggestion for you: ORDER WHOLE WHEAT CRUST. Homemade pizza company has whole wheat crust–it tastes awesome and you feel better about yourself because it is healthy. No reason to order regular crust when you can enjoy the same toppings on their yummy crust. My favorite things- It’s fun to be able to create your own pizza and put it in the oven. There’s still the sensation of choosing your toppings but you don’t have to buy them and prepare them. It’s also fun to and sample the different toppings, so having a pizza party with my friends was the perfect setting for the event. And the ingredients are FRESH and wholesome, which makes me even more eager to try more of it. My gripes- I love thin crust pizza, but i also like a little crunch in my pizza. Their directions told me to cook the pizza on their included parchment paper and I didn’t want to mess anything up, so I followed their advice. The bottom of the pizza was a bit floppy, and I wish I had removed the parchment paper for the last five minutes to char the bottom. Also, the price point is a bit higher, but it’s worthwhile every so often. Also, they are handing out many coupons for $5 off, so look out for those! All in all, the pizza was fresh, fun, and a refreshing change from eating out 🙂 It’s something you should try, especially when you don’t want to sit in a restaurant. Be mindful of the prices, and keep an eye out for those deals… OR stop by the Logan Square location today and tomorrow for free pizza and a celebration of their new store opening! your review is making my mouth water! I've been meaning to try this place and after reading this I'm definitely going to do it soon 🙂 Keep up the awesome reviews! Try the Miesian, sans tomatoes…but add prosciutto, green peppers, and mushrooms. By far, the most amazing pizza I have ever consumed…and I have eaten A LOT of pizza!